On Special is a set ofBrand New Alpha Irons Custom Fitted with Graphite Design Shafts. You get 8 clubs, 4 to 9, PW and GW. The Alpha RX-1 benefits from a super deep cavity back, wider sole, and slightly oversized face. The result is an iron that encompasses true forgiveness. Easy to hit, the RX-1 has a super high MOI that makes each shot amazingly straight youll feel like a pro. It is the ideal club for the mid handicapper who is looking for more consistency in his game. They look good, and play great. Each Alpha RX1 is custom built to match your exact playing requirements. You will be amazed how quickly your game will improve, along with your scores. Find out the best golf shafts. The Alpha Irons will be designed and built to your exact specifications, through a custom fitting process designed to give you optimum performance from the new clubs. These Alpha RX1 Irons retail for $1300, and are a great buy at this price. At $799 This is a unique opportunity to purchase an exceptional set of clubs. 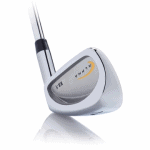 The Alpha Golf Irons are on special for a limited time only, Buy them now and dont miss out. Joe Conde holds an Engineering and Electronics degrees , as well as a Masters degree in Marketing. He has worked most of his professional life in Enterprise Software Solutions such as Oracle, Peoplesoft, and many more. When Joe retired some years ago, he started building golf clubs, and has built an extremely successful Club Fitting business Better Golf Clubs.